The United States lags behind the rest of the world in providing paid family leave. In a study of 185 countries, only two besides the United States failed to ensure that new mothers get paid time off from work; the United States was also one of very few countries that doesn’t extend paid leave to fathers. Some US states, however, are experimenting with ways to catch up with the rest of the globe: Four of them, now including New York, guarantee residents paid leave. But some forms of paid leave are better than others at fighting gender inequality. When done right, parental leave can do a lot to help working women. It gives them a much-needed break to recover, adjust, and bond when a new child arrives. For heterosexual couples, a new father’s leave has other lasting ripple effects: If he takes two or more weeks off, he’ll end up being more involved in his baby’s direct care—feeding, bathing, and changing diapers—and a more competent and committed father later in his child’s life. Governments can design their parental-leave policies to promote gender equality… or not. The trick is to make sure that both men and women take leave. If women are the only ones taking time off, it stigmatizes them in the workplace: Why hire a woman if she’s more likely to disappear for a while? It also reinforces women’s presumed role as the primary parent. 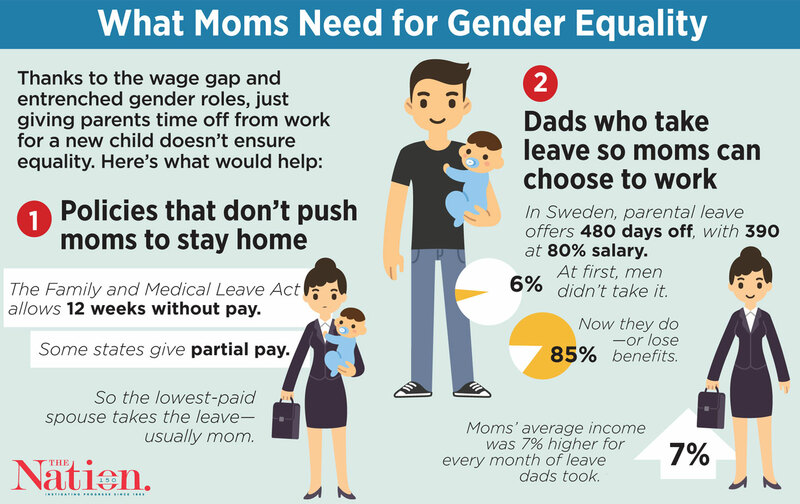 Right now, mothers tend to take leave instead of fathers because the gender wage gap often ensures that sacrificing Mom’s work means less of a pay cut for the family than sacrificing Dad’s. In the United States, the only federal parental-leave policy is the Family and Medical Leave Act, which guarantees 12 weeks of unpaid time off for people who have worked at companies with 50 or more employees for at least a year. When the leave is unpaid, women are a third more likely to take it than men. If men are offered paid leave, though, they’re much more likely to use what’s available to them. After California implemented a paid-leave program for all residents in 2004, the number of fathers taking time off doubled, and the length of those leaves increased. Still, even in California, women are twice as likely to take leave as men. After all, Californians who take time off don’t receive full pay. The typical benefit is 55 percent of their usual weekly salary, capped at about $1,000 a week. This is basically how New York’s new leave program is set up: Workers will get about two-thirds of their normal weekly wages, up to a cap. Congressional Democrats’ nationwide proposal is similar. But a new experiment is happening in San Francisco, which is now the first US city to require fully paid family leave, with employers paying the difference between the worker’s full salary and payments from the state program. Time will tell if this has a more dramatic effect on what men decide to do, but at the very least, families will not be forced to give up a father’s full salary. And the rest of the state has beefed up benefits as well, so that low-wage workers will soon get 70 percent of their pay while on leave, while higher-paid workers will receive 60 percent. Even with bigger payouts, however, it’s hard to rewire centuries of patriarchy. In Sweden, which implemented a paid-leave policy that guaranteed 80 percent of a new parent’s salary with a cap of about $65,000, only some 6 percent of men took advantage of the policy in its first 17 years. In the name of promoting greater equality, Sweden redesigned the policy a few years ago; now a father is required to take at least two months off before his child turns 8 or he will forfeit his benefits altogether. After the change, 85 percent of fathers took leave. The effects of these so-called “daddy quotas” on women are huge. Swedish mothers’ incomes have been found to rise 7 percent for every month of leave their husbands take. In Quebec, which has implemented a similar policy, fathers have increased the time they spend on care work and household chores, while mothers now work longer hours outside the home and are more likely to work full-time and earn higher incomes. Any progress toward paid leave is great in a country like the United States that has fallen so far behind international norms. But as paid leave becomes mainstream, equality will lie in the details.